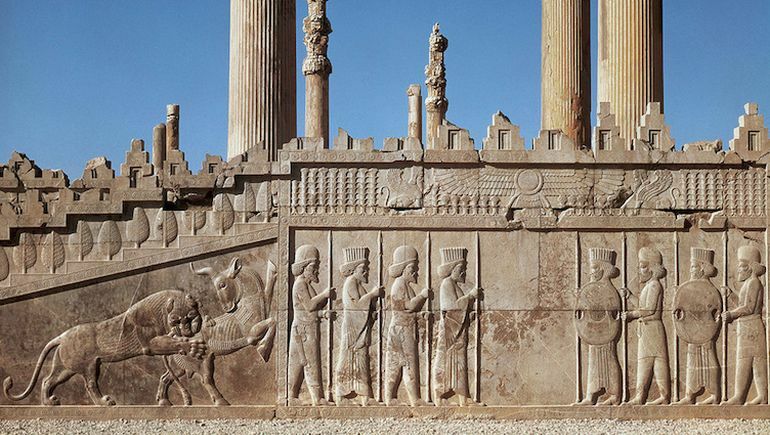 The Apadana stairs at Persepolis. Credit: Khan Academy. While the story of human ancestors go back to a period 7 million years ago, the advent of anatomically modern humans only harks back to a momentous epoch which started around 200,000 years ago in Africa. A small percentage of the Homo sapiens populace migrated out of Africa – possibly around 100,000-70,000 years ago; and only around 50,000 years ago, modern humans were finally able to make their progression from survivability to adaptability with developed parameters like language and culture. However during all these millennia, the human population probably remained less than 1 million, until the rise of agriculture. The farming of rice was already achieved in China possibly around 13,500 years ago, along with Neolithic founder crops being planted in Levant around 11,500 years ago. So by 1 AD, the population of humans around the world took an incredible boost and jumped to around 170 million. The timelapse animation by American Museum of Natural History finally picks up from that point (at the 1:00 mark), with its fascinating details that follow the course of humanity in sheer numbers. And thus we are presented to the striking historical factors that pushed forth (and also decimated) significant parcels of human population throughout the last two thousand years. Interestingly enough, if we look closely enough, in spite of the dominance of far-flung empires like the Romans of Europe, Hans of China and Guptas of India, the human population remained fairly static till 600 AD, at around the 180 million mark. By 1000 AD, the figure steadily increased to around 260 million, interspersed by significant events like the golden Mayan age, invention of gunpowder, rise of Islam and the dread of small-pox in Japan. The numbers grew even more rapidly in the coming centuries, reaching 380 million, until the advent of the Mongols in 13th century AD. The subsequent geo-political events and destruction wrought by the nomadic invaders stalled the rate of population in various regions in Asia and Eastern Europe, And finally, and very rarely, the human population actually dipped in the 14th century, after being afflicted by the baleful ‘Black Death’ (Bubonic plague). To that end, the video in itself possibly presents ‘modest’ figures of around 30 million deaths caused by the pandemic, with other sources hypothesizing a staggering number of 75 million human fatalities. In any case, once again by 15th century, the global human population picked up its pace, fueled by endeavors like the discovery of the New World and even flagrant episodes of trans-Atlantic slave trading. However it was only in early 19th century that the effects of Industrial Revolution and improvements in medical technology played their crucial role in boosting the global human population to over 1 billion. The rate of growth by this time was unmatched by any period in human history, and has since kept its flourishing (and yet ominous) pace till the present era (in spite of disastrous events like World Wars). In essence, when viewed from the lens of known history, it took nearly 200,000 years for humans to reach the population of 1 billion, but only 200 years to cross the 7 billion mark.